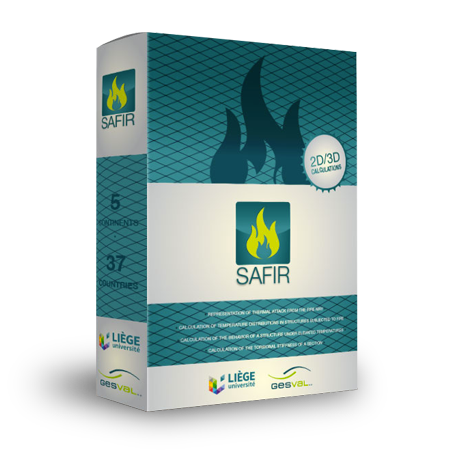 Safir is a computer software for the simulation of the behaviour of building structures subjected to fire. The fire is introduced as a data (in term of a curve giving either the evolution of the gas temperature in the fire compartment or the evolution of the net flux on the surface of the structure) and the Software calculates the evolution of the temperature in the structural elements which can be discretized in 2D or 3D. SAFIR has been developed from the beginning as a tool for modeling the behavior of structures subjected to the fire. The link between the thermal analysis and the structural analysis is thus quite straightforward. It is founded on high performance finite elements, yet it runs on quite ordinary Windows based PC. Its utilization is not complex, provided that the user has a good knowledge of non linear modeling. Training sessions can be organised at a reasonable prize (800 euros per day, plus travel and accomodation, excluding VAT). For more technical information about SAFIR, please consult the SAFIR website. For questions regarding the sales process, please check our FAQ. This licence grants you a lifetime right to use SAFIR 2019, fully functionnal, for use in research and publications. No commercial use is allowed. Windows 10 : fully supported. Windows 8.1 : fully supported. Windows 7 : fully supported. Windows XP (all versions) : fully supported. Windows Vista : this version is not supported by SAFIR ! You can buy SAFIR using a credit card (« Paypal » option, works with a simple credit card. You get it within a few minutes), or by bank transfer (you get it within a few days after payment). If you need a pro forma invoice for your accountancy to make the bank transfer, please go through the order checkout, choose as payment option "bank transfer" and validate. You will get an email with an order summary containing all your billing information and the payment informations (IBAN, SWIFT, Bank name and address, account holder) and which can be used as pro forma invoice. You will get the final invoice, together with the access to download SAFIR, when the payment is validated. Payment by bank transfer to Gesval S.A, with communication "SAFIR". Once the payment is validated, you get an notification email. As soon as you get this email, you can connect to your account on Gesval (https://www.gesval.be/en/inscription/edit), click on the « licenses » tab, and find the links to download : (1) SAFIR, and (2) your personal « identity.key » file (see screenshot below).